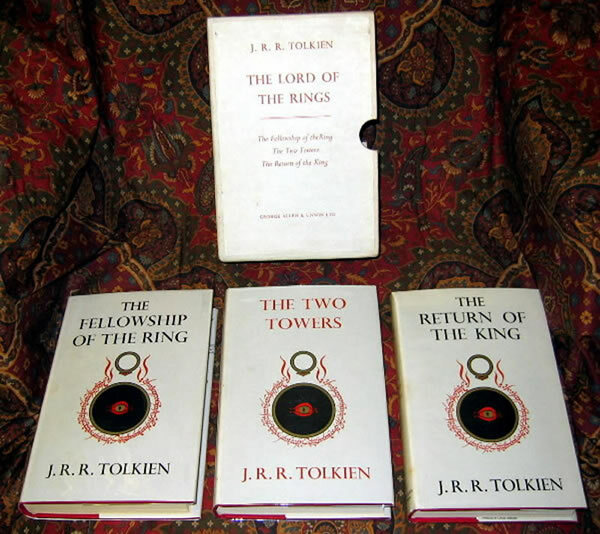 1st UK Lord of the Rings 1959 & 1960 editions - Near Fine w/dustjackets & Publishers slipcase - SOLD George Allen & Unwin, very likely one of the first sets to be issued in the original publishers slipcase. George Allen & Unwin, very likely one of the first sets to be issued in the original publishers slipcase. 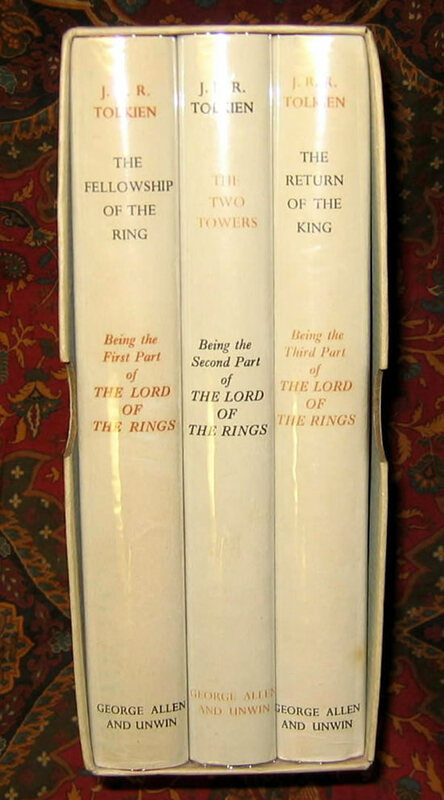 This 1959 - 1960 set of the UK 1st Editions, differs in one respect from the norm. The case is covered with what appears to be a light grey cloth, rather than the usual paper covering. It also differs in it does not have the large staples at the bottom and top, showing inside the box. Must be one of their earliest issues before production constraints changed how they were produced. 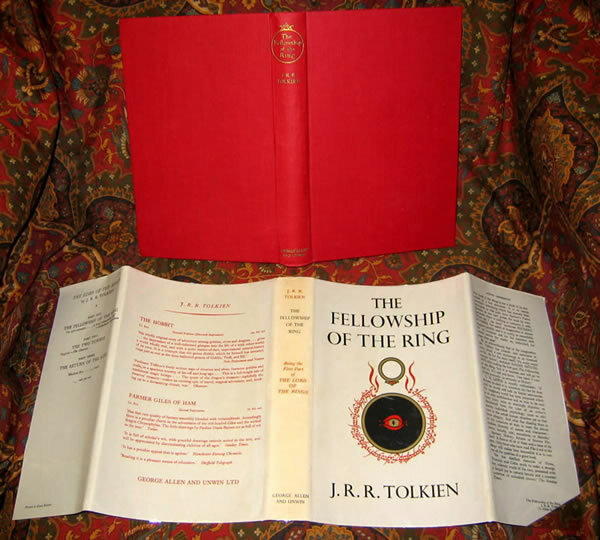 The Fellowship of the Ring, in its original and correct 9th imp dustjacket, is a 9th impression published in 1960, which claims to be an 8th impression published in 1960. 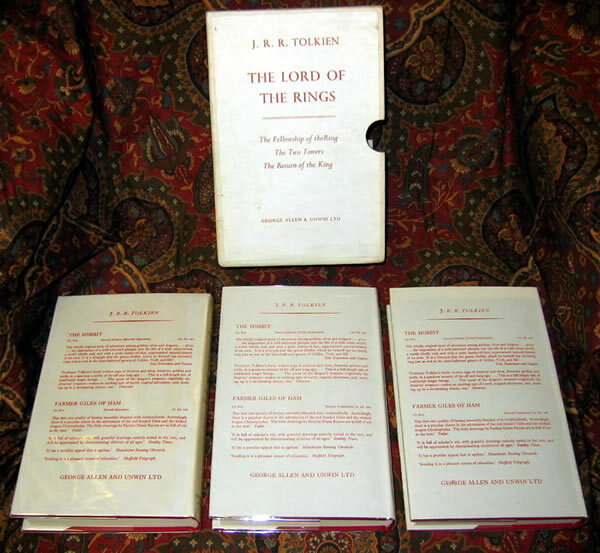 As per 'The Tolkien Collector', this is one of the issues where the printers error misidentifies the impression, by ommitting the "8th impresson published 1959". 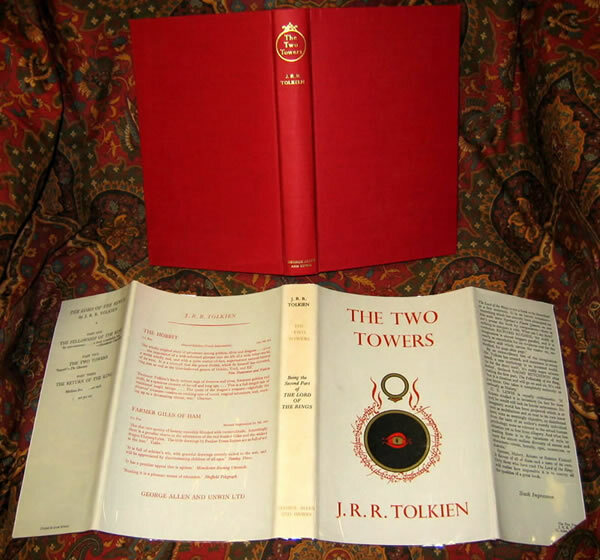 The Two Towers is a 6th impression published in 1959 in its original and correct dustjacket. 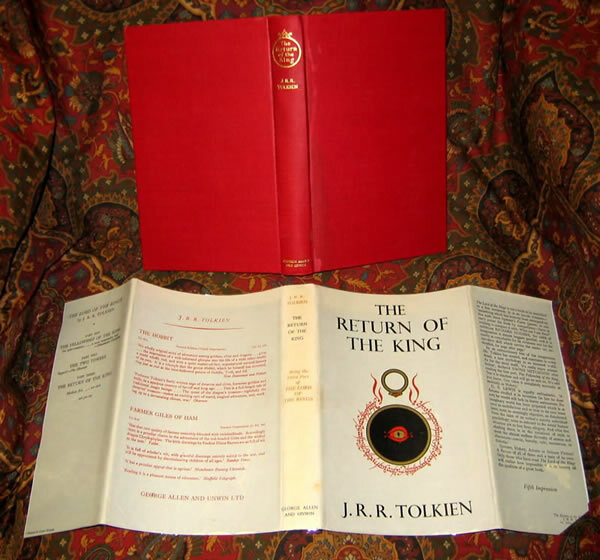 The Return of the King is a 5th impression published in 1959, also in its original and correct dustjacket. This copy has had a dribble of water that has run down the front boards, near the upper joint. The wrapper is internally stained with a corresponding red line, but does not show through, and does not affect the interior or text. The dustjackets are neatly price clipped. None of the books have any writing or inscriptions. There is absolutely no foxing or offsetting in any of the books. The text block is clean and bright, edges are also clean & bright. The red topstain is clean, with only the single water mark on the one volume. The exterior cloth is extremely clean, vol 1 has slightly crumpled head and tail of spine, otherwise near fine, with the gilt untarnished and bright on all three books. The books look unread, and the maps are attached, and in excellent condition. The price clipped dustjackets are in excellent shape with no chips or loss evident. No restoration on any of the dustjackets. All are the correct impression dustjacket's for each of the three books. Without the usual tanning, and only the lightest of fading to the red lettering on the spines. A beautiful matched set, only fault being the small dampstain to the front boards on the RotK.